In the days before a dolphin named Sgt. Pepper died last week at The Mirage Hotel & Casino in Las Vegas, two animal rights organizations had filed a complaint against the Mirage’s request to import two more dolphins for its habitat. Part of the complaint, ironically, said more dolphins shouldn't be brought in because other dolphins had died in the past at the habitat, which the two groups claim is being used as a money-making entertainment enterprise, rather than for educational or conservation purposes. MGM Mirage spokesperson Gordon Absher said the purpose of the breeding would be to increase the habitat’s number of dolphins “to continue our study and research” at the dolphin habitat. “As with every endangered or protected animal, the more we can observe and the better we can understand their situation in the wild,” Absher said. But animal rights activists see a different motive for the Mirage's request — it wants more dolphins solely to produce a profit, says Born Free senior program associate Monica Engebretson. “They want additional performers and they want to try to breed new performers. Of course baby dolphins are especially attractive to people so they like to have that constant,” Engebretson said. The Web site for the Mirage’s dolphin habitat says it hosts educational programs for K-12 students, guided tours throughout the day and a “trainer for a day” program where visitors are given an opportunity to play, train and feed the dolphins. Engbretson says that's not the case at the Mirage. “More of their research has to do with how to keep dolphins in captivity, which has nothing to do with conservation, it has to do with entertainment. 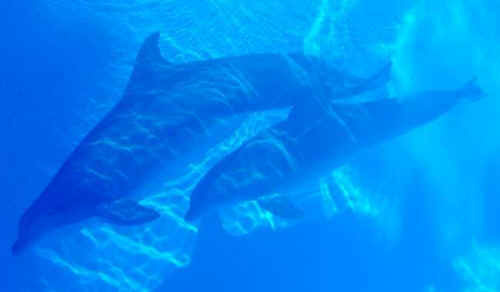 They’ve already demonstrated that they can’t keep dolphins in alive in their tank,” Engebretson said. Two-year-old Sgt. Pepper died Thursday of complications of a lung infection. MGM Mirage spokesperson Monet said the Mirage’s animal care staff and veterinarians had been actively treating Sgt. Pepper for the lung infection for months after being diagnosed in December 2008. A necropsy will be performed on Sgt. Pepper to determine further information on his death. Sgt. Pepper was the 14th to die at the Mirage dolphin habitat since the attraction opened in 1990. Five of the 14 dolphins were stillborns or died shortly after birth. The U.S. Department of Agriculture has initiated an investigation into the latest dolphin death at the Mirage, a spokeswoman said Wednesday. The department completed an investigation into the death of Sage last year and the results of lab tests were "inconclusive," the USDA report said. There is no enforcement action planned from the 2008 death investigation, the spokeswoman said. Though the date of import stated in the Mirage’s petition was June 1, the NMFS has not yet approved the request. The animal care team at the Mirage said the death of Sgt. Pepper should not slow the application process unless NMFS find issues at the facility that need to be investigated. The Mirage imported Lighting, Sgt. Pepper’s father, from a captivity facility in Florida more than three years ago.